The multiple imputation procedure helps you understand patterns of “missingness” in your dataset and enables you to replace missing values with plausible estimates. It offers a fully automatic imputation mode that chooses the most suitable imputation method based on characteristics of your data, while also allowing you to customize your imputation model. Generate possible values for missing values, creating several "complete" sets of data. Analytic procedures that work with multiple imputation datasets produce output for each "complete" dataset, plus pooled output that estimates what the results would have been if the original dataset had no missing values. These pooled results are generally more accurate than those provided by single imputation methods. 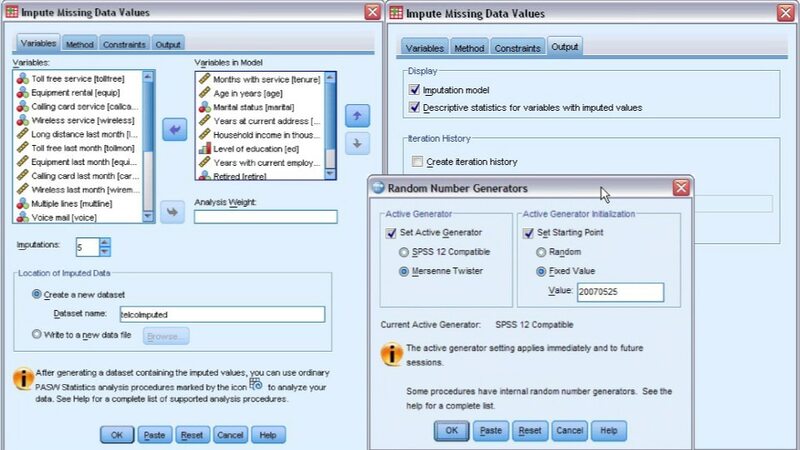 You can quickly diagnose a serious missing data problem using the overall summary of missing values report. The missing values pattern report provides a case-by-case overview of your data. It displays a snapshot of each type of missing value and any extreme values for each case. The overall summary of missing values report can display pie charts that show different aspects of missing values in the data. The variable summary is displayed for variables with at least 10 percent missing values, and shows the number and percent of missing values for each variable in a table. It also displays the mean and standard deviation for the valid values of scale variables, and the number of valid values for all variables. A patterns chart displays missing value patterns for the analysis variables. Each pattern corresponds to a group of cases with the same pattern of incomplete and complete data. IBM SPSS Missing Values requires a valid IBM SPSS Statistics Base license.